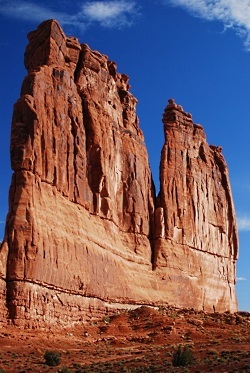 As with its neighbor, Canyonlands National Park, Arches National Park conceals most of its wildlife from visitors. That said, lizards are easy to spot, as are mule deer in the cool times of the day. And if you spend a little time before breakfast, or after dinner, you just might see coyotes, porcupines, desert cottontails, black-tailed jackrabbits, and many songbirds. Because of the high heat during the summer months, most of these animals will be most visible when humans are not typically out and about. Desert animals have a variety of adaptations to deal with the hot weather and aridity. A key adaptation is that most animals are nocturnal, being most active at night. 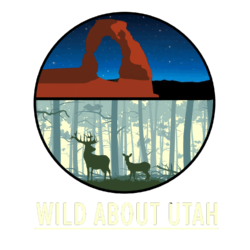 Nocturnal animals in Arches include kangaroo rats, woodrats (also called packrats), and other small desert rodents, skunks, ringtails, foxes, bobcats, mountain lions, bats and owls. Some desert animals are “diurnal”, or primarily active during the day. These include rock squirrels, antelope squirrels, chipmunks, lizards, snakes, hawks, and eagles. Many animals have are only active in certain temperature ranges, and they alter their active times of day depending upon the season. During winter months, snakes and lizards are in an inactive state of “torpor,” or sluggishness or even dormancy. But they become active during the day during the late spring and early fall, and then become “crepuscular,” or active mainly during the nighttime hours, to avoid the daytime heat of summer. Insects, too, alter their times of activity. Mosquitoes, as you no doubt know, may be out from dawn through dusk, depending on the temperatures. But they are not active after the sun goes down. 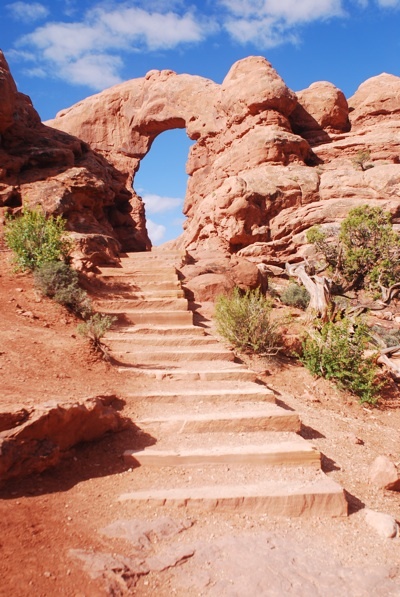 In spite of Arches’ rather inhospitable appearance, almost 50 species of mammals live in the park’s landscape. 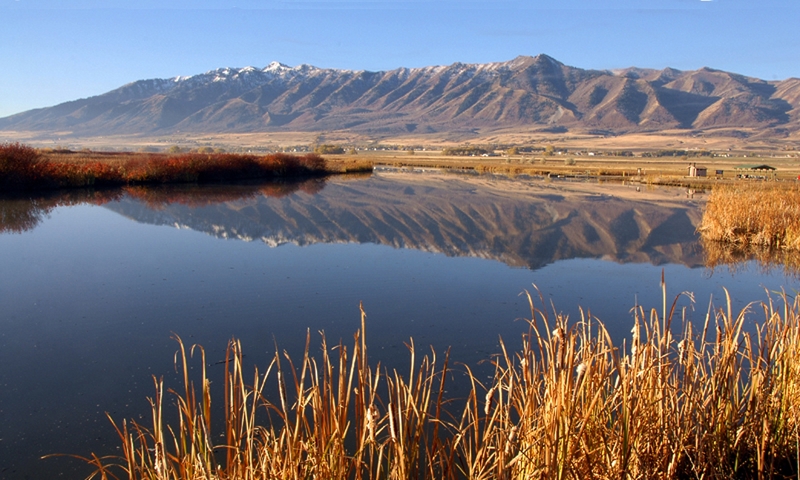 But the hot climate and lack of water favors small mammals. Because of their size, these animals are less able to migrate, but have an easier time finding shelter, and require less food and water to live. Rodents are numerous: there are eleven species of mice and rats. 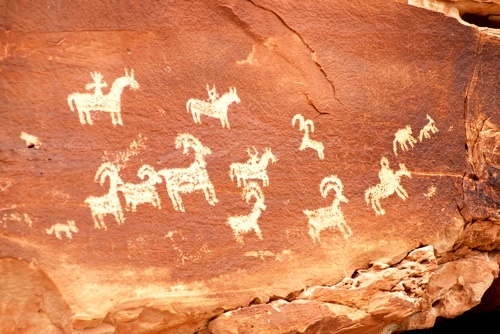 Desert bighorn sheep are one of the larger mammal species to be seen. They are frequently spotted along Highway 191 south of the park visitor center, and call Arches home all year long. They roam the talus slopes and side canyons near the Colorado River, forage for plants, and negotiate the steep, rocky terrain with the greatest of ease. While Arches may not be considered a prime bird watching hot spot, 273 species have been seen in the park, which includes seasonal, year-round residents, and migrants. Much of this diversity is due to the riparian corridors like Courthouse Wash and the Colorado River (which forms the park’s southern boundary). Mornings along these corridors often are filled with birdsongs during spring and summer. You might spot blue grosbeaks, yellow-breasted chats, and spotted towhees. Listen carefully and you’ll hear the trill of the canyon wren echoing from the sandstone walls. Great blue herons hunt the shallows for fish, while Cooper’s hawks deftly maneuver through the tangle of trees beyond the riverbanks. There is life in the desert, if you know where, and more importantly, when, to look for it. Text: Kurt Repanshek/Patrick Cone, NationalParksTraveler.com.